At the 2019 Cattle Industry Convention in New Orleans this week, Radio Oklahoma Ag Network Farm Director Ron Hays had the chance to catch up with Kent Bacus, director of international trade and market access for the National Cattlemen’s Beef Association. 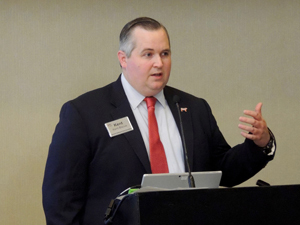 During their conversation, Bacus addressed the status of the ongoing negotiations between the US and China which he hopes will eventually result in China granting the US beef industry broader access to their market. According to Bacus, China represents tremendous opportunity for the US beef industry, as home to one-fifth of the entire world population and a middle class that is larger than the entire US population. However, China’s restrictive laws and regulations pertaining to the importation of beef continue to limit the US beef industry’s ability to meet the nation’s growing demand for high-quality beef. However, before that happens, Bacus says China will have to relax its policies. At least for US beef, which he contends is widely know and regarded as a safe product, suggesting that China’s overly cautious restrictions are unnecessary in its relationship with the US beef industry. While it is uncertain at this time what these negotiations will accomplish, if anything, Bacus says the US Meat Export Federation estimates that the US beef industry could stand to export up to $4 billion worth of product to China in just five years, given improved access. Listen to Bacus and Hays discuss the current status of trade negotiations ongoing with China, as well as Japan, and the impact possible trade pacts could have on the US beef industry, on today’s Beef Buzz.